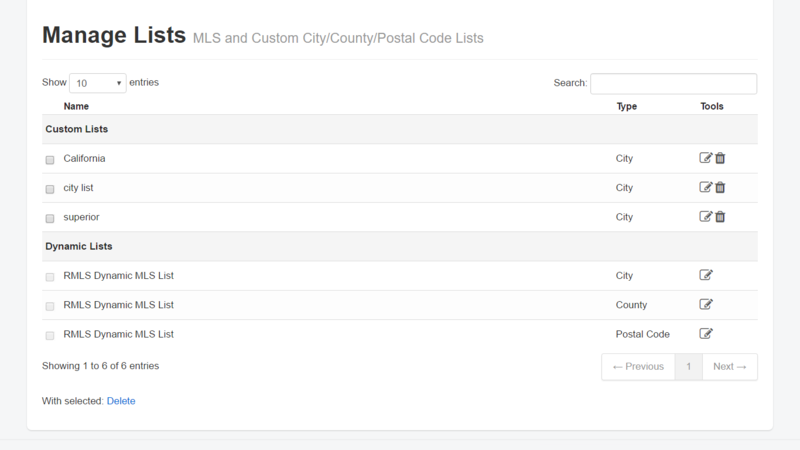 Create, manage, and edit your custom city/county/zip lists in one place! Apply Lists to All Pages! Apply custom lists to any search page, or all of them! Only IDX Broker Platinum gives you this much flexibility. Simple List Management! Manage your lists in one place with the new list management tool. There's no need to click 3x through a wizard in order to get to the list that you want, or to apply that list to your pages. Simply choose your list from the most current MLS data and only listings that fit the list criteria will display on your results pages. If your MLS doesn’t have listings in that area you can also select from our internal list of cities, counties and zip codes to customize your search results.